I’ve been following the career of Ben Elbel for a while. 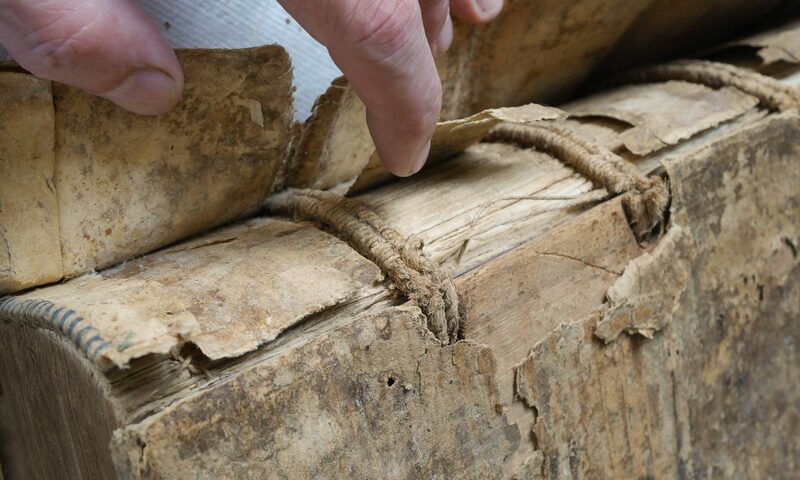 Originally his onion skin binding structure caught my eye. It has a cleverly elegant design, and is one of the few genuinely new binding structures I have seen in the past 25 years. I met him in Amsterdam earlier this summer, and he was kind enough to write up a review of my large Delrin folder in his current newsletter, which is well worth subscribing to. Benjamin (French nationality, 1983) fell in love with bookbinding while studying art in Strasbourg, France. From the beginning his interest has been towards the experimental side of the craft; however, determined to learn the ‘proper’ ways he embarked on a journey that took him to Switzerland (Ascona- Centro del bel libro), Germany (Göttingen- die Buchmanufaktur) and England (London- Shepherds Bookbinders, Book Works). After these years of working in the trade he started his own bindery, Elbel Libro Bookbinding in Amsterdam providing bespoke bookbinding services. Ben is known for his research in bookbinding and over the years has developed a number of innovative book and album structures such as the onion skin binding, which he shares via workshops and printed tutorials. In May, Jeff Peachey gave a workshop in the Netherlands (the workshop was organised by Herre de Vries, Natasha Herman, Wytze Fopma and Restauratoren Nederland, and took place at bindery FopmaWier). Jeff is an American bookbinder, conservator and tool maker, whose work I have long admired so when I heard he was going to be around I jumped on the occasion to invite him to the bindery. Jeff made me a gift: a special folder that he’d made, called the ‘Delrin’ folder. Delrin is a plastic with a very low coefficient of friction, similar to Teflon, which means that it doesn’t leave shiny marks on materials. However, unlike teflon, it is hard. 1. The friction really is very similar to Teflon. I now use it without fear on virtually anything, except perhaps very rough and very dark papers. 2. Its big size is really comfortable for rubbing down. If held like on the picture above, one can really cover large areas very quickly and apply a lot of pressure with less effort than with a small tool. 3. The thin tip is brilliant for rubbing material in grooves without leaving shiny marks and again, the large size means it can be held like a knife and used with maximum pressure. As one can see on the pictures I have already used it a lot but it shouldn’t be a problem to re-grind it to refine the tip. Thanks a lot, Jeff, for introducing this new tool! 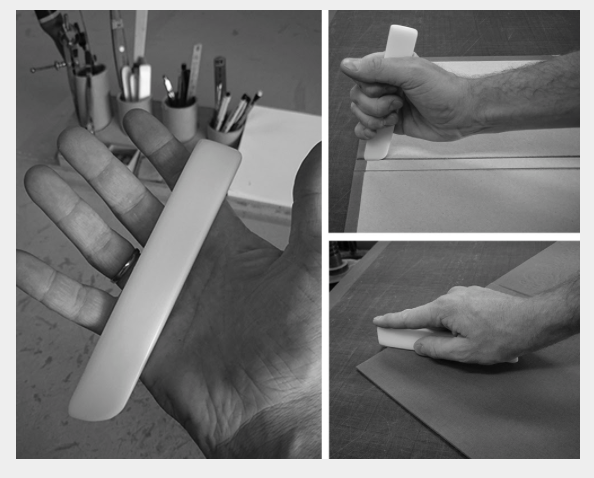 Republished from Elbel Libro Bookbinding, Newsletter, Summer 2016. Sign up for it here.